During lead nurturing, it is important not to overwhelm your prospects with information that they do not understand; this will simply confuse and deter them from trading. Instead, focus on simple messages that are easy to understand and even easier to action. Exceptionally large downward movement on MPC (NYSE). A good time to buy, or a start of a downward trend? We recommend avoiding complex technical content such as Fibonacci Patterns, and rather focus on simple messages like "Large Movement" as in this example. These types of messages are simple for traders to digest, yet compelling enough to present interesting market opportunities. We have 7 different types of analysis; Big Movement, Consecutive Candles, Technical Chart Patterns, Support/Resistance Levels, Fibonacci Patterns, Macro-Economic Analysis, Company Valuations. Each of these is applicable to different types of traders at various stages of their life-cycle. It’s difficult to find any business that doesn’t rely on some form of customer messaging. Some still use email, others use SMS, while others use push notifications. 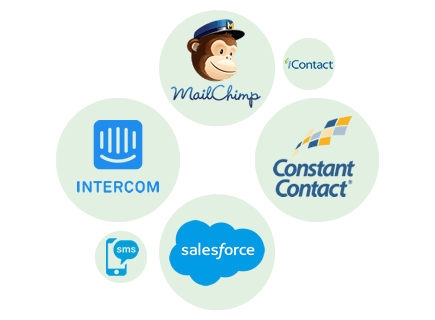 Whether you’re using SMS, Push Notifications, Intercom, MarketingCloud, Pardot, MailChimp, etc, our solution will connect to the way you do business and communicate with your customers.